Lightweight, non-metallic, asymmetrical-shaped toe cap. Meets US and Canadian safety standards including ASTM F2412-11, ASTM F2413-11 I/75 and C/75 impact and compression and CAN/CSA-Z195-14 Grade 1. 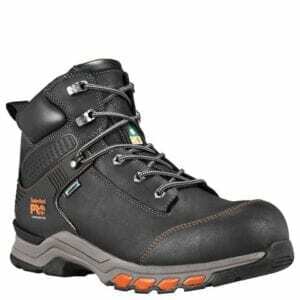 Meets CAN/CSA-Z195-14 safety standards for footwear incorporating electric shock resistant soles. Flexible non-metallic plate minimizes the likelihood of puncture wounds. Meets US and Canadian safety standards for ASTM F2412-11, ASTM F2413-11, ASTM F2892-11 PR puncture-resistance and CAN/CSA-Z195-14 Grade 1 with protective soles. A breathable membrane helps protect from diseases caused by blood-borne pathogens. Meets ASTM F1671-07 safety standard. Timberland PRO® Anti-Fatigue Technology absorbs shock with each step while returning energy back to the foot in key zones, providingmore strength and stamina at work. Meets CSA standards for Grade 1 and has sole puncture protection and has a protective toe. Meets CSA standards for resistance to electric shock. Keep your receipt and call: 1-800-501-3054 within 30 days of purchase. 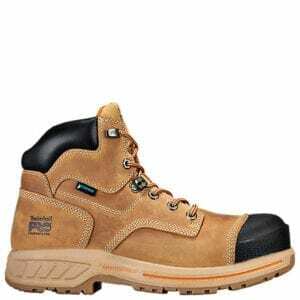 Available on footwear with PowerFit® comfort system or Anti-Fatigue Technology.